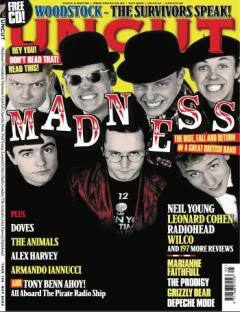 "Suggs is due to meet Uncut in an Italian cafe in Camden Town. He puts on his crombie and silk scarf and starts a sprightly walk from his north London home, en route passing dozens of key flashpoints in the history of Madness, the band he's fronted for more than thirty years. He passes a municipial park where his bandmates Lee Thompson and Chris Foreman once worked as gardeners, walks past several Irish pubs where he and his bandmates have experienced dozens of lock-ins over the years, past a Greek Cypriot cafe where they signed a one-off deal with Jerry Dammers' 2-Tone label, and turns down Camden High Street. He walks past Escapade, the joke shop where they filmed the video for "House of Fun"; past the premises of Alfred Kemp & Son Ltd, the second-hand clothes shop where the band bought their vintage mod suits; and past what was Berman and Nathan's, the theatrical costumiers who kitted them out in colnial pith helmets, fezzes, gorilla costumes and policeman outfits for various videos. He walks past the former site of Rock On records, where a teenage Mike Barson stole a Fats Domino album before an early Madness rehearsal. By this time Suggs has been recognised by several dozen people. Some stare, some point, some shout out "Wahey! Suggsy!" from moving cars. He reaches Parkway and passes the Dublin Castle, the Irish pub where Madness famously blagged their first proper gig in 1979, before alighting on the Good Fare, the fifty-year-old Italian cafe where the band used to meet..."
This article snippet is from "UNCUT" take 144, May 2009. In the UK, it is on sale for four pounds and forty pence and in Canada for twelve dollars ninety-nine. If you can't get hold of it in your local shop, try their website; although it looks as if you can only subscribe, not order a one-off issue.